We have a global footprint for a reason. Our U.S. sites can provide quality service with a local touch, across multiple time zones. 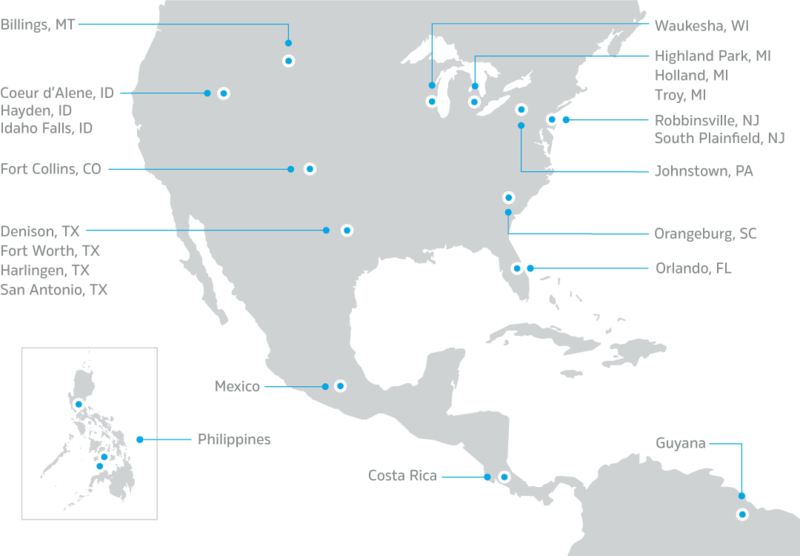 Our facilities in the Philippines and Central and South America are equally important in expanding our scope. Understanding different cultures leads to understanding people better, which is all part of our philosophy. We’re located in ten states, and each city offers a different lifestyle for our employees. From Idaho to New Jersey and everywhere in between, we have the capacity and skillset to provide you with the services you need. Mexico, Costa Rica and Guyana all provide their own strengths to your business. Because of the size of Mexico City, Mexico offers a dense talent pool of employees and keeps our culture at its core. With English as its first language, Guyana lends a Caribbean-influenced culture as well as quality service. Also with high rates of English-speaking urban areas, Costa Rica is rich in diversity and talent. The Philippines are a competitive area for contact center and outsourcing work. Between the country’s largely young, technology-proficient population, and its blended Eastern-Western culture, its major cities are becoming big contenders against India and China for the outsourcing industry. More and more businesses are looking towards the Philippines for outsourcing services, and we are among those providing an attractive work environment for employees. EROS Building Dr. V. Locsin Street & Real Sts. © Qualfon. All rights reserved.